Do my best to explain the problem I have with my Iron Horse Sunday DW Link. OK first I noticed I had some play in my back wheel. Thought it might have been Hub bearings but it wasn’t. Next I started stripping the linkage. No play in any of the upper linkage or the shock pin linkage. Found the problem is the rear end (closest the back wheel) of the DW Link. 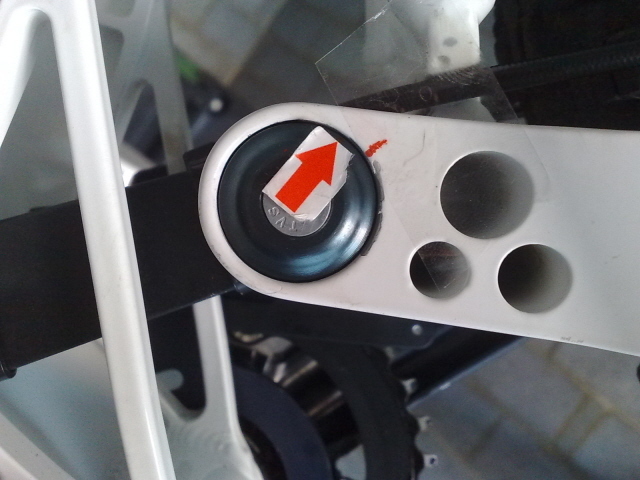 The DW rotates on the pin rather than the bearings rotating. Thought it might be the bearings so I removed them cleaned the housing and replace with new ones. When tightened up to 13NM there is still a very small amount of play in the DW Link laterally. It is my understanding that when tight the DW Link should compress against the inner part of the bearings so the whole assembly DW Link, Pin and inner part of bearings become as one. Got some ideas of how to rectify this but wondered if anyone else has experienced this. The 3rd picture shows the DW Link assembly out of the frame. There isn’t any play when like this which suggests the bearings are being held too far apart by the frame. Last edited by jamesstuart; 04-20-2009 at 01:18 PM. go to www.ridemonkey.com and look in the Downhill forum. there's a BIG dw-link thread, right at the top as a sticky. lotta people there to answer questions. If you have ridden the bike with the piviot rotating in the axel as apposed to the bearing you could have issues with the axel rather than the bearings. I can't tell what generation linkage that is, but my '06 had spacers b/t the bearings and the frame. If you're not the Max E bearings (that have the spacers built in) it looks like you're missing something. Looks like you have the bearings with the extended inner race that are supposed to seat flush against the link to prevent play. It may be that the bearings aren't pressed all the way into the frame. 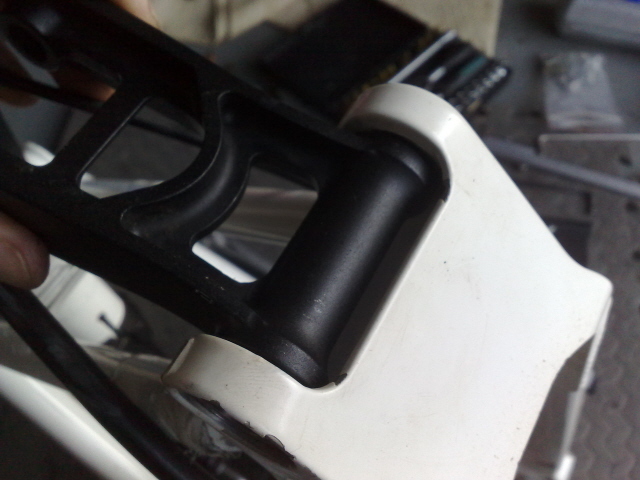 Check for pieces of paint or metal where the bearings seat against the frame. I had the same problem and just used the spacers in there between the bearings and the link to take up the extra space. 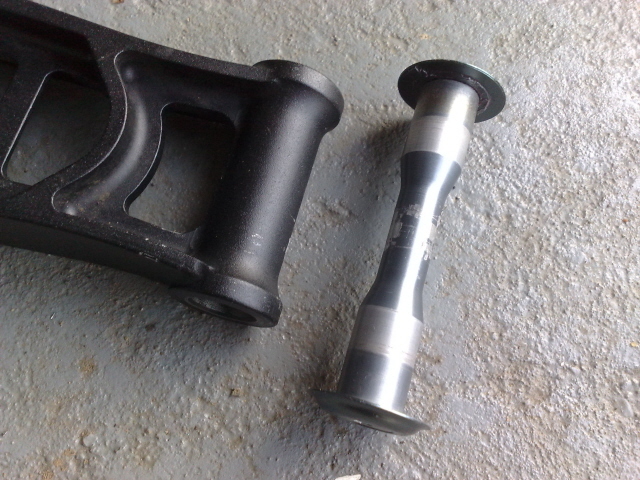 Hopefully you know a machinist who can make you some spacers, or somebody with spare parts. Good luck. You might also want to check your shock DU bushings and hardware. Sell it while you can man. Its an 08 bike with MAX-E bearings. There is no wear on the pin or DW Link as I said the movment is lateral (side to side). Cleaned the Frame Cups twice now and pressd the bearings in. We are only talking of 0.5mm max but its enough that the DW link rotates on the pin rather than the pin on the bearings. If you haven't already, start digging through this thread. It's not likely you're the only one to have this problem. If it was me, and I was sure that was where the slop was coming from, and everything was there that was supposed to be, I'd look for some spacers to throw in there. OK I have worked out what the problem is. As I noted above when assembled out of the frame there isn’t any play. 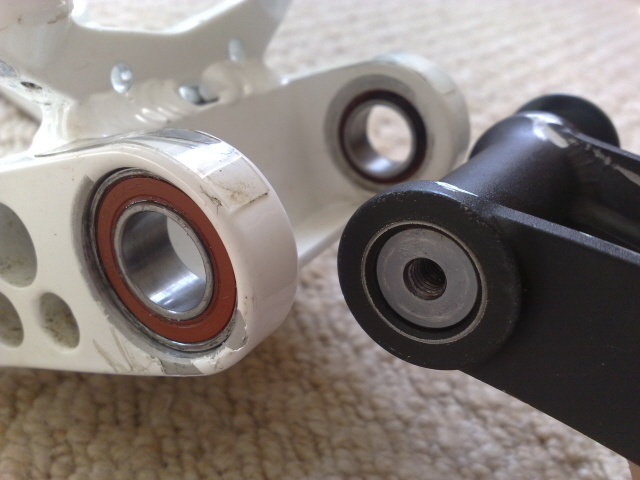 This is because the assembly is aloud to compress more and the problem isn’t that the frame holding the bearings off. The actual problem is the DW Link. 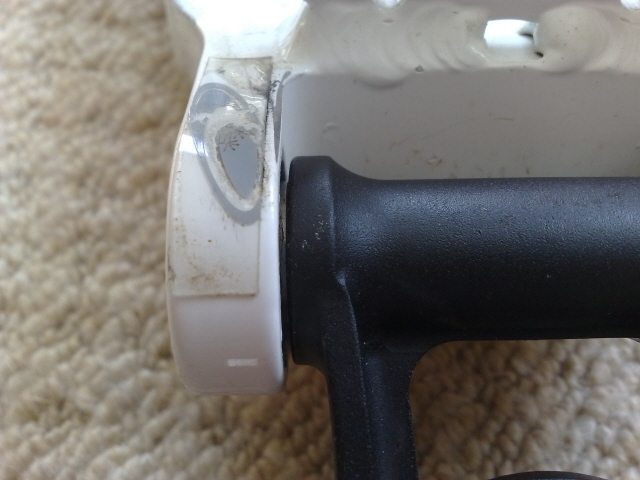 Because its cast alloy and therefore quite soft and the bearings are steel therefore hard the result is a slight wear on the clamping face of the DW Link, on mine it was about 0.1mm either side. 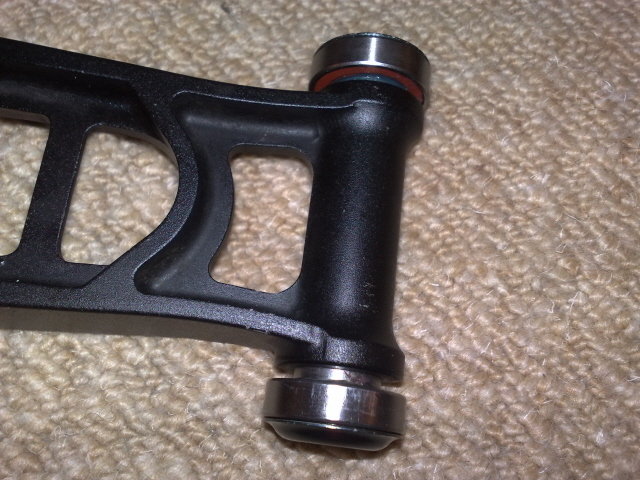 I have put some shim washers either side and the assembly is now perfect and shouldn’t wear anymore. 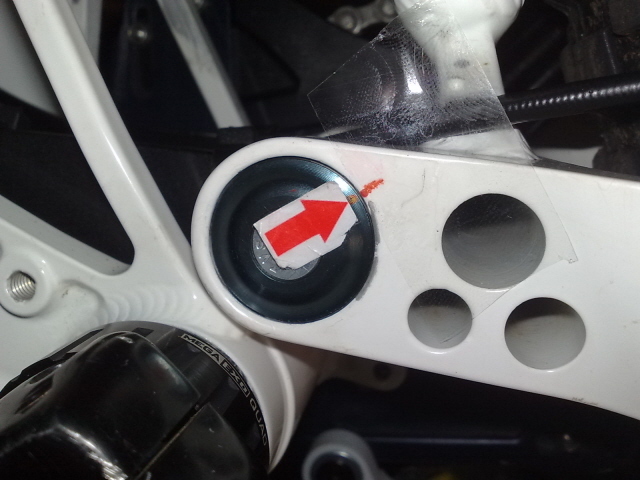 One way to find out if your linkage has a problem is to see if the dust cap rotates when under compression. If not then it’s likely that your bearings need replacing and you may had done the same to your DW Link (see pictures below). If you would like some shim washers please message me. I can do a bag of 2x0.1mm 2x0.2mm 2x0.3 for a small cost.